L-R Diane Roberts, Joe Patton & Katrina LawsonBangor University recently presented a cheque for over £4,000 to local charity Tŷ Gobaith after another successful year of fundraising. Tŷ Gobaith Children’s Hospice is the adopted charity of Bangor University. Every year a variety of activities are held to raise funds for this great cause and on this occasion the University was delighted to present the charity with a cheque for £4000.27. The presentation was made by Miss Diane Roberts who works at the University for Santander as a University Relationship Branch Manager. When Diane heard that a weight loss challenge was being organised to raise funds for Tŷ Gobaith, she joined the challenge with a colleague and obtained match funding from Santander. 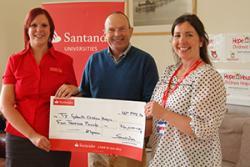 With £700 support from Santander, the weight loss challenge efforts raised a total of £1,933. The remaining monies were generated from the sale of Tŷ Gobaith key rings, a carol service held in the School of Education and the proceeds of the University’s staff lottery. Mrs Katrina Lawson, Tŷ Gobaith Area Fundraising Coordinator, for said: “Year upon year we are astounded with the level of support Bangor University gives Tŷ Gobaith, sister hospice of Hope House. We need to raise over £1 million a year to ensure we are able to look after life limited, life threatened babies, children, young people and adults as well as their families. To have the continued support and thousands of pounds raised annually is extremely important and we are so grateful to each individual who either plays the lottery or was sponsored to lose weight, thank you all”.